Recognizing talent and supporting school art programs in Mobile and Baldwin County. 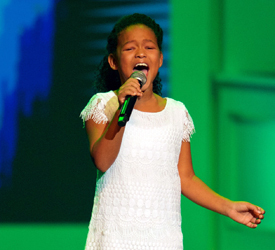 Bring recognition to talented young performers in our Gulf Coast communities. Encourage all youth in our community to pursue the arts. Provide funding for arts programming to schools in Mobile and Baldwin Counties. Studies have shown that participation in the performing arts is linked to positive outcomes in school, emotional development and family life. During the 62-year history of Distinguished Young Women, we have taken the opportunity to shine a light on the talents of young women to not only reward those who excel in the performing arts but to also encourage all young people to discover a passion for the arts. In an effort to encourage even more youth, the 3rd Annual Gulf Coast Spotlight Talent Showcase strives to shine the spotlight on talented young performers right in our own community, encourage and reward their pursuits and give funds to our local schools to support arts programs, thereby reaching more children in the Gulf Coast region.